The Connemara Meadow Preserve consists of 72 acres of former farm land in Plano. The Montgomery family donated the land to the Connemara Conservancy to protect the land in its natural state for future generations. Below are photos from the January 3 Bird Walk. Note, there are more photos of the land than birds because land and plants are more cooperative subjects for this amateur photographer. The bird experts said we saw 41 species. I am not sure I saw half of them. Two American Goldfinches and an Eastern Bluebird. The meadow will be alive with color in a few months when the wildflowers come into bloom, however I think the various shades of gold and brown are just as beautiful. A Sparrow. We saw four species and I am not sure which one this is. Double Crested Cormorants, American Wigeons, and possibly some other water birds I cannot identify. The birds got tired of being watched, but left some nice scenery. I was a photographing the big three winged, one legged bird and also got a shot of a real bird. This is probably the Great Blue Heron that was flying around. I purchased this home in May of 2004. Since I brought over 30 plants from my prior home and I rarely walk away from a plant sale or nursery empty-handed, I immediately began working on the landscaping. Almost five years later, I continue to find the need for a new bed, a bigger bed, a new plant or a plant that needs to be relocated. Below is quick tour of the last four and a half years in my garden. May 2004. It all started in 2004 with a plain, 30 year old house with a plain landscape to match. June 2004. Wasting no time, I removed the planter boxes and scale-covered euonymous that spanned the front of the house. The soil was deep in the planter boxes and fostered past termite infestations. July 2005. 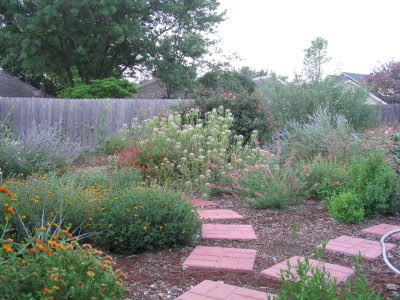 I removed the grass near the house and created large beds for native and adapted shrubs and flowers. In the photo are dwarf yaupon, datura, red yucca, rudbeckia lantana, and coreopsis, Mexican bird of paradise and verbena bonariensis. July 2005. With the front yard off and growing, it was time to focus on the backyard. After a year of mowing the backyard, I decided I would prefer a natural looking backyard and I began removing all the turfgrass and weeds. It took a summer of weekends to remove the grass by hand. By the Fall, I began planting. March 2006. This was the start of a very dry year. There was very little rain, lake levels dropped, and the city imposed watering restrictions. Fortunately, I am a native Texan and these conditions are not new to me. I planted native and adapted plants, used organic gardening techniques, mulched, and watered within the restrictions to establish the plants.May 2006. Even with the drought conditions and limited watering, the plants grew and bloomed. September 2006. The clammy weed, zexmenia, pitcher sage, Russian sage, mutabilis rose, lantana, and red yucca are thriving. September 2006. While my neighbors complained that their yards were dead or dying due to the drought and watering restrictions, mine was thriving and full color. November 2006. A morning dew covers the garden. Clockwise are Mutabilis rose, Deer Grass, Autumn Sage, Lantana, and Mexican Bird of Paradise. Late February 2007. A dust storm blows in. June 2007. 2007 was one of the wettest years on record. Many plants had lush growth, however others that prefer drier conditions did not perform as well. Featured in this photo are Liatris, Salvia coccina, Katy Road Pink rose, Artimisia 'Powis Castle', and Clammy Weed. July 2007. The colorful front flowerbed attracts hummingbirds and butterflies. September 2007. Clammy Weed with a honey bee. September 2007. The beginning of my prairie grass obsession. The Buffalo Grass I planted from seed a month earlier is growing quickly. Indian Grass and Shenandoah Switch Grass are behind the Buffalo Grass. October 2007. For most of the year, Gulf Muhly does not look too special, but it really shines when the plumes are backlit in the Fall. October 2007. Shenandoah Switch Grass. November 2007. Shenandoah Switch Grass glowing in the Autumn sun. December 2007. "Frost Flowers" on Salvia Coccina. This occurs when moisture in the cell walls of the plant freezes and expands through the stems. The same effect occurs on frost weed. March 2008. Four Nerve Daisy. This is a great flower for well drained, sunny areas. So far, it has bloomed all year for me. Unfortunately, bees and butterflies do not seem very interested in the flowers. April 2008. Mutabilis rose, Indian Grass, and Buffalo Grass. The Buffalo Grass was planted from seed in August 2007 and was over 12 inches high by April 2008. I was not expecting it to get quite so tall. September 2008 Backyard. Pine Muhly and Indian Grass in the foreground. Flowering Senna is almost finished blooming in the background. September 2008. Beebrush and Turks Cap. November 2008. Monarch on Eryngium Leavenworthii. December 2008. Little Bluestem waiting to be planted. I bought about 60 one gallon plants on clearance for $1.25 each. These will form the foundation for my front yard prairie. It is a new year and I thought I would try something new to broaden my horizons. In this electronic age, everyone seems to have a blog, or some other online outlet so I decided to start my own blog of to share my inner-most thoughts, feelings and, maybe, some of my poetry. I recently found several great Austin area garden blogs and thought something along that line would be a better topic for a blog than my thoughts, feelings, and poetry. My ever-changing, ever-expanding, suburban garden started almost five years ago. The focus is on Texas native plants, with a few adapted, non-Texans. My latest garden obsession is growing the grasses of the Blackland Prairie. This blog experiment will follow my adventures in gardening and provide documentation that my landscape is planned and intentional...just in case a Code Enforcement Officer comes knocking on my door and threatens me with a citation if I do not mow my weeds.